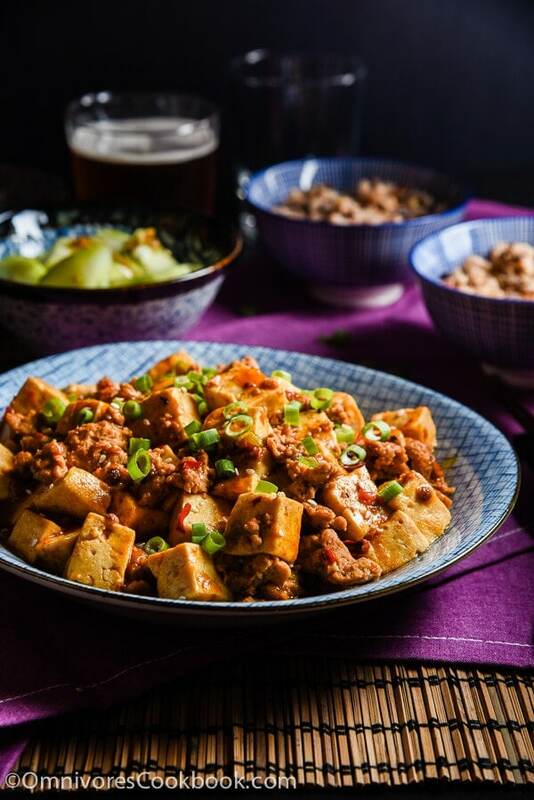 An easy mapo tofu recipe that creates the authentic taste of China. 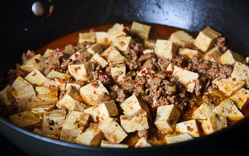 Mapo tofu (麻婆豆腐, ma po dou fu) is one of the most popular classic Sichuan dishes. It has a spicy, pungent, and appetizing flavor that goes perfectly with steamed rice. 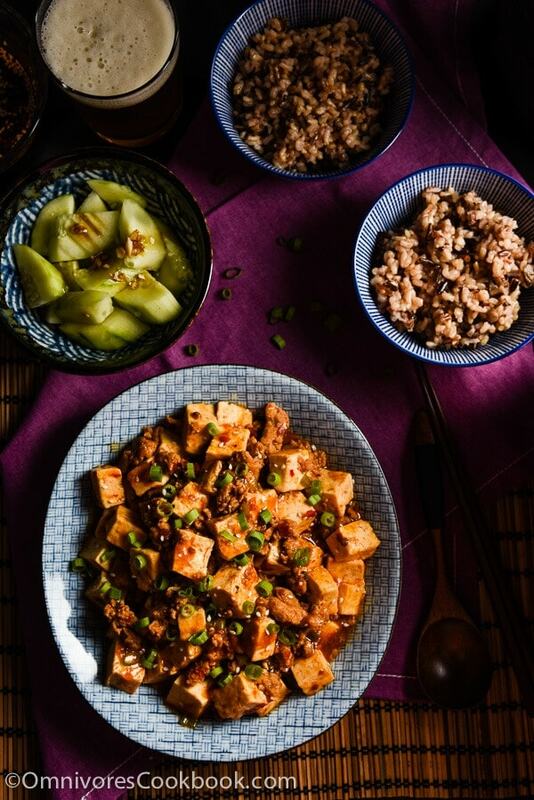 I love cooking mapo tofu for a quick lunch or dinner. Sometimes I double the meat and sauce, so it will be enough to serve two people as a one-dish meal. I also like to add a handful of greens (mustard greens or spinach) at the end of braising, to create a more nutritious and balanced meal. 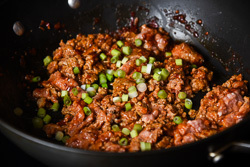 I often replace the ground pork (used in the authentic version) with ground turkey to cut calories. For special diets, you can make it less spicy and skip the rice so it will be paleo friendly. You can also make it into a vegan dish by replacing the meat with mushrooms. 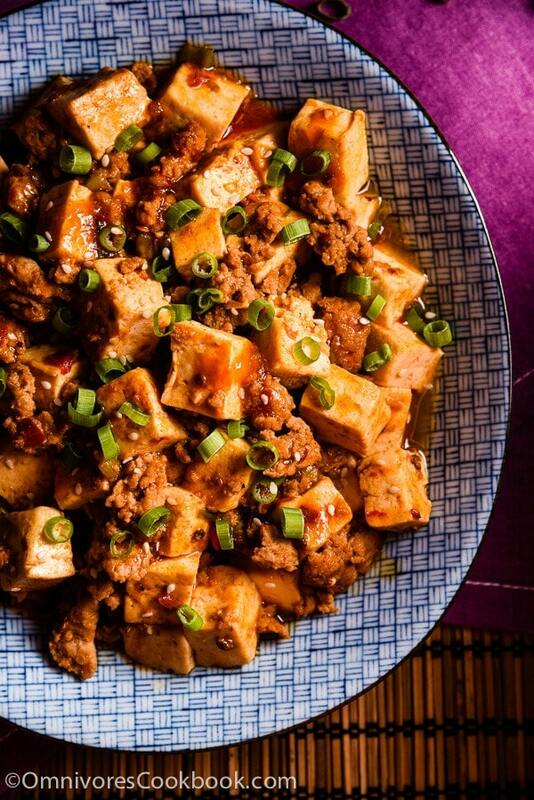 Yes, mapo tofu is such a versatile dish! 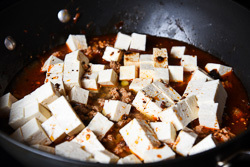 I’m sharing my basic mapo tofu recipe below. It creates the very authentic taste that you’d get at a restaurant in China. However, based on this recipe, you can easily twist the dish according to your preferences. Doubanjiang (豆瓣酱), also known as spicy fermented bean paste and broad bean sauce, is the most important ingredient in this dish. Try to find “Pixian Broad Bean Sauce” at an Asian market. Pixian is a small county in Sichuan province that produces the best broad bean paste. If you’re using this brand, you’re already halfway there. You can also purchase this brand on Amazon here. The other important ingredient is chili oil (辣椒油). Although you can purchase bottled chili oil at the grocery store, I highly recommend you make it at home. Freshly cooked chili oil tastes much better than store-bought and is free of additives. You only need five minutes to cook it and it is really easy. You can find an easy chili oil recipe here. If you have more time, you can also refer to the more complicated chili oil in this recipe. It takes some effort to cook, but you won’t look at chili oil the same way after you try this one. You will usually cook more chili oil than you’re able to use in one meal. You can store the the extra oil in an airtight container in a cool, dark place for up to two weeks or in the fridge for up to two months. 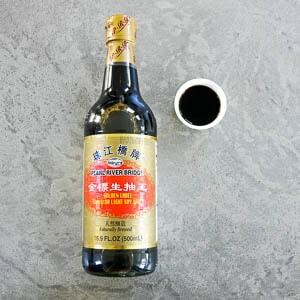 You can use the chili oil in various dishes, including bang bang chicken, Lanzhou beef noodle soup, green beans with spicy peanut Sauce, and dan dan noodles. You can also add it into a dipping sauce for potstickers, or add it to wonton soup to enhance the flavor. Click here for more delicious Sichuan recipes. 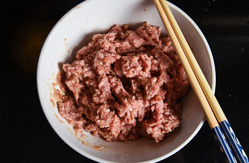 Combine ground pork, cooking wine, soy sauce, and ginger in a bowl. Mix well. Combine cornstarch with 1 tablespoon water in a small bowl. Mix well and set aside. Cut and prep tofu and herbs. Heat vegetable oil and Sichuan peppercorns in a large nonstick skillet over medium high heat. When the Sichuan peppercorns turn dark brown and crispy, scoop them out with spatula and transfer into a bowl layered with paper towel to soak extra oil. Save to use for garnish the dish. When oil is hot, add ground meat and Doubanjiang. 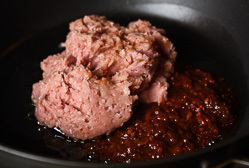 Stir-fry over medium heat with a spatula, until pork is evenly coated with Doubanjiang. Add green onion and stir fry for another minute. Spread tofu evenly on top of ground pork (*See footnote 2). Add chili oil, five-spice powder, and sugar. Pour in water and cook until bringing to a simmer. Simmer, covered, over low heat for 10 to 15 minutes, until tofu becomes tender and the sauce has reduced to half the original amount. Taste the tofu with some broth (be careful, it will be very hot!). Adjust seasoning by adding salt. If the dish is too spicy, add another teaspoon of sugar. Gently mix well with spatula. Meanwhile, ground the fried Sichuan peppercorns (you used when heating up the oil) in a coffee grinder or by using mortar and pastel. Mix cornstarch water again until fully dissolved and swirl it into the skillet. Gently stir a few times with a spatula, until sauce thickens. Turn off heat and transfer everything to a bowl. Garnish with green onion and a small pinch the ground Sichuan peppercorns, if using. Serve warm over steamed rice or by itself as main. You can skip the meat and make this dish a vegetarian one. In this case, I highly recommend replacing the meat with mushrooms (such as rehydrated dried shiitake mushrooms) to enhance flavor. Do not stir the tofu immediately after adding it into the skillet, in order to keep the pieces from breaking apart. The tofu will get firmer after braising and you can stir it once it's cooked. The Sichuan peppercorns add a numbing nutty aroma to the dish. The fried Sichuan peppercorns has a more roundup body so it is works great for garnishing the dish or in a salad. You only need a small around in this recipe to finish up the dish. Store the rest in an airtight container no longer than a month. This recipe was originally published 23 November 2013. This looks wonderful, but you don’t seem to mention the chili oil again even though you say in the text that it’s needed for this recipe? Is there something missing from the recipe part? Oops! My mistake — I see you listed it under sauce instead of oil in the ingredients. Can’t wait to try this! Yes, I used homemade chili sauce from another recipe instead of chili oil from supermarket. Although they are interchangeable, I like the homemade chili sauce better, because it’s fresh and have better flavor. Also it’s very easy to make and you can store it under room temperature for relatively long time – about 1 month. Thanks for the advice! I poked around a bit in the store and didn t see any Sichuan peppercorns that looked green and red like yours. The dried prickly ash all looked like dark brown balls. I was led astray by the spicy bean sauce because the jar had a picture of mapo tofu on it! I may try this dish again after learning from my mistakes. Thanks! Thanks for such a delicious and easy recipe Maggie! 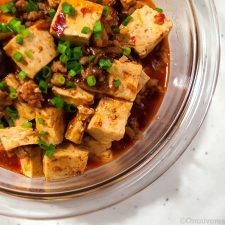 I’ve tried another mapo tofu recipe that was not very successful, but when I saw your recipe, and how I already had all the ingredients at home, I decided to try making it again. It was a HUGE hit with my husband, and it will be on my regular dinner rotation! 🙂 I also love reading about your Austin restaurant adventures – I live in Houston and travel to Austin a few times each year and enjoy reading about the new eats in town to check out. Keep up the good work! I’m so glad you tried my recipe and liked it Joyce! This is such a comforting dish that we cook it at home very often. I didn’t realize we’re so close! We travel to Houston once in a while. It has a great collections of Asian restaurants and markets there, and I grab Shaoxing wine (the non-salted kind) there. I cannot find Shaoxing wine in Austin! Is the doubanjiang really 3 tablespoons and not teaspoons? I’ve made it twice using no salt containing ingredients except the doubanjiang (no soy sauce or chicken bouillon) and have used both 2 and 3 tbsp. Both were too salty. :(. I see another recipe online that calls for only 2 teaspoons of doubanjiang (lady and pups). Hi Tim, I’m pretty sure I used 3 tablespoons when I was cooking this recipe, because it is the main ingredient. One of the reasons I can think of, probably I was using another brand of doubanjiang back then (I considered it common to find). I made sure I added enough so the dish won’t taste plain when serving with rice. I switched to the authentic brand now. From the ingredients of the recipe, I’d probably add 1 to 2 tablespoons (or 1 tablespoon plus extra homemade chili oil). I will need to test this recipe again so I can found out the correct measurement. I’ve checked the recipe from Lady and Pups, it looks gorgeous! I like the idea of adding chicken stock into the stew. Thanks for helping me troubleshooting the recipe Tim. I’ll make sure to revise and fix it. Keep up the excellent work. You’re awesome! Hi Tim, always so happy to see a new reader who appreciates real Chinese flavor! 🙂 I agree with you, it is very difficult to find the authentic flavor outside of China. That’s the reason that I mostly cook Chinese food at home and seldom go trying out new restaurants these days. As for the doubanjiang, you can try Lee Kum Kee. That’s the brand I used to cook with and it might be less saltier. But the Pixian one is supposed to be the real deal (the one you’re using now). One of the great way to add flavor is adding tons of homemade chili oil into the dish, like the recipe from Lady and Pups. If you’re cooking with my recipe again tomorrow, try 1 tablespoon doubanjiang and more chili oil (maybe use chicken stock instead of hot water). If you’re making chili oil with a less spicier type pepper (Korean chili pepper instead of Thai chili pepper), you can use quite a lot to add flavor without making the dish too salty. Late to the party, but i also thought that 3 tbsp of the pixian with low sodium chicken stock was too salty. Checking the nutritonal facts, as far as salt content is concerned, 2 tbsp of pixian is about equal to 3 tbsp of lee kum kee. I tried 1.5 tbsp with no sodium chicken stock, and though the result was a bit bland. Im currently making this with 2 tbsp and no sodium chicken stock and have been happy with the results. Just another data point for anyone browsing here. Looks like a great recipe, and I’m going to try it tonight with one quite important addition: Sichuan peppercorn. When I lived in Chengdu I don’t think I ever had this dish without that Sichuan spice. Not sure how it can be called authentic without it. I totally agree with you on the Sichuan peppercorns. I usually add 2 teaspoons when heating up the oil to make the oil smoky and fragrant. When the Sichuan peppercorns turns dark brown, scoop them out and transfer to a small bowl with paper towel to soak extra oil. Once the dish is cooked, you can ground the sichuan peppercorns in a coffee grinder and sprinkle on the tofu. The freshly ground fried peppercorns have a more roundup flavor and nutty aroma. Not sure why I skipped it when I published the recipe… Going to edit it right now. My husband was hankering for mapo tofu. I knew I would find a great recipe at your website. We loved this. I really liked the flavor and kick of the Sichuan peppercorns. Thank you for the recipe !!! Hi maggi am so happy and excited I stumbled upon your website! I did Mapo tofu today and you are right absolutely…the best! Been doing other recipes…now I have to delete them all in my recipe file! Thanks! And you are so pretty! I look forward to doing all in your cookbook! Thanks for that freebie! Wow! Made this tonight and it was delicious! Flavors and seasoning were perfect! Ahh, yes. Very good. I feel like I’ve been looking for this recipe for a long time. Thank you! How much mushroom would you suggest I use to replace meat? Great recipe! I absolutely love Mapo-tofu. I was wondering, what’s the green vegetable side dish in the first picture? It looks delicious! This was fantastic! I surprised my husband with this recipe today and he was silent (mouth full) for two big helpings lol! Thank you I will keep this in my repertoire along with some of your other fabulous dishes! Made this tonight with chicken and tofu. It’s abolitwly amazing, better than in any restaurant! Thank you so much for sharing this. I made this for dinner today and it was very good. I did not have chilli oil so I just added 2 fresh chillis. I also added some button mushrooms (leftover in the fridge) to make it a more complete one dish meal. Thanks for sharing! Looking forward to trying your other recipes. That so so amazing. tofu looks delicious. so cravings! I love beef. I must try to do this dish tonight. Thanks for your recipe!! Wow, I followed your recipe. I did it for my girlfriend to eat. She liked it very much. Thank you so much . This is an amazing dish. I’m making it again tonight but wondered if I could cut out the meat entirely? Would it have enough flavor and is there anything I could replace it with? Tasty, but too hot for me, even putting 1 tbsp chilli paste, excluding chili sauce and peppercorns. Tofu!! I like tofu, I have cooked it with meat before, the recipe is not the same. I think I’ll try your recipe, it’s not too much complex. What’s kinds of rice in your photo? Thanks for sharing. My mom love tofu. I don’t usually cook for her. I’ll surprise her by cooking this dish. Thanks for your sharing and all the photos. This is an excellent recipe. Very tasty. I usually find it difficult to get an authentic taste when I make Chinese food. I don’t seem to have the knack of balancing flavors. However, by following your recipe, I was able to achieve a delicious result. I did cut down on the chili bean paste to suit my taste. Hi Maggie, thanks for the recipe! Have tried it twice and it is delicious. One thing I ‘ve found is that the final dish has quite a bit of oil floating on the top. Do you have any tips to make it less oily – using less Sunflower oil at the start perhaps, or replacing the chili oil with fresh chilies? Hi Dolores, you can totally start with less Sunflower oil at the beginning if you’re using a nonstick pan (1 teaspoon is probably enough). It’s also possible to replace the chili oil with chili flakes, but I really prefer the homemade chili oil because it’s more fragrant. Question about making it vegetarian. Hi Maggie, I love your blog so much. Thank you for being such a good cook and giving us good recipe. I would love to make this tofu next week for Chinese New Year on Wednesday. How do I add the dry shiitake mushroom? Is it better with dry shititake or fresh one okay too? How long should I Stirfy the mushroom? I am cooking for 8, how many Tofu should I use? and how much shiitake ? 1 large dry package? It uses fresh mushrooms and the taste is great without using shiitake mushrooms. Re serving size, it really depends on how many dishes you will be cooking. But I’d say doubling the recipe (2 blocks of tofu) will generate plenty, considering you’ll be also serving other dishes. PS. Highly recommend the 3-year old doubanjiang from the Mala Market (https://themalamarket.com/collections/all/products/3-year-aged-pixian-chili-bean-paste-doubanjiang?aff=2). It’s so rich. I used it to make vegan mapo tofu the other day and it turned out so good. The shipment might not able to make it for your CNY party, but it’s something that’s really nice to have if you cook vegetarian dishes a lot. For Asian cooking sauce, I’m not sure if you’re looking for a basic sauce like soy sauce, or a packaged premade sauce. I use soy sauce from Kikkoman and Pearl River Bridge and both of them do not contain MSG. Most packaged premade sauce contains MSG, but I think some of them at Wholefoods use natural ingredients. Thank You! I just ordered the Pixian red package! I remembered I bought it last year, but the package smell bad un-opened so I threw it away 🙂 I wish I knew about the Mala Market 3 year old Doubanjiang. I am moving the dinner to Friday the 8th. I wonder if they can deliver it by Thursday. I went for dinner last week in Culver City Chinese restaurant Fifty one https://www.fiftyonekitchen.com/menu ( the Mapo tofu vegetarian one) I don’t know what type of mushroom , it was silky and its seems they minced it. Anyway, Thank you for responding. You helped me tremendously. I found Sichuan / Pixian / Pi Xian Broad Bean Paste 16OZ (454g) on Amazon for $7.45. Hope this is the same sauce. Loved your recipe. Made a few changes to my taste: but loved the way you have laid out all the steps and ingredient info. Maggie, it looks awesome! So much flavors packed on this recipe that makes this simply irresistible, definitely having this on my table! I really like your recipe and it’s prolly one of the most delicious Mapo Tofu I’ve ever eaten. Although there’s a problem when I made it, because my bro say it’s salty but when I tried it, it’s fine and I’m glad most people agreed it’s really delicious so I think maybe it’s prolly cultural difference that some people aren’t used to the numbness of sichuan pepper. But I’m not sure where I went wrong. I followed exactly your recipe except that I didn’t put salt on it(which is doesn’t make sense why he said it’s salty). 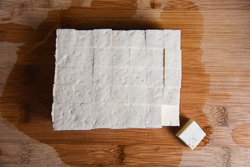 There are so many different types and firmness of tofu, which one should be used? Hi Jun, you can use medium firm or firm tofu for this recipe. Sometimes I even use soft tofu when I want a heartier texture! Looks yummy, I eat tofu sometimes, Mapo tofu is easy but tasty. I saved your article and will try it soon. Thanks for the recipe. Great recipe. I have vegan dish made of tofu sometimes, so I’ll cook this without meat. Will have and enjoy it this week. Thanks for your post. Simple instruction but tasty with the adding of a lot spices. I always like tofu, I will definitely cook it. Thanks for all photos and nice post. I just returned from two incredible weeks in Chengdu, and already miss the food. Thanks for this website. Since I live near San Francisco’s Chinatown, getting the ingredients will be easy. I brought home some red and green peppercorns just in case!